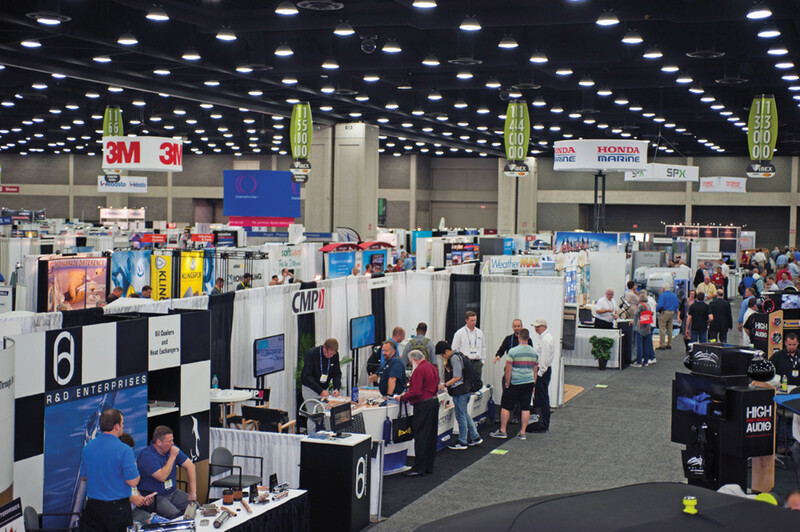 IBEX is a place where innovation abounds and there was more new product on display at this year’s show than at any in recent memory. 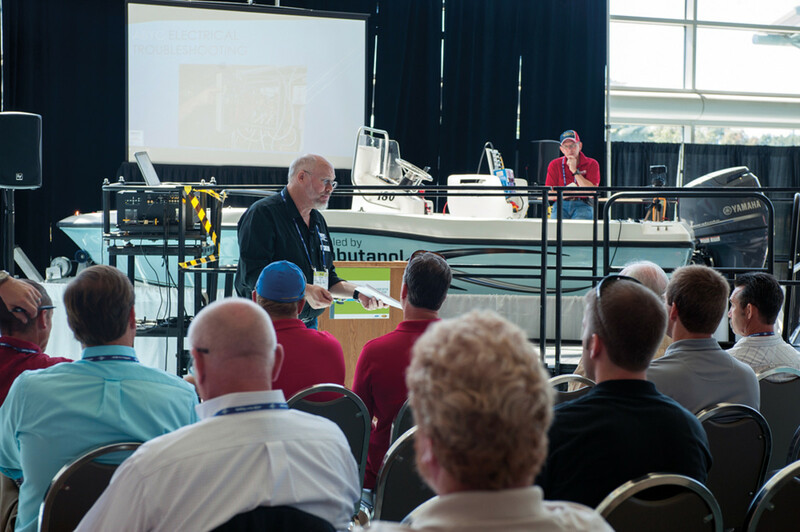 There is no disputing that the International BoatBuilders’ Exhibition & Conference will be held in Tampa, Fla., in 2016 and 2018. 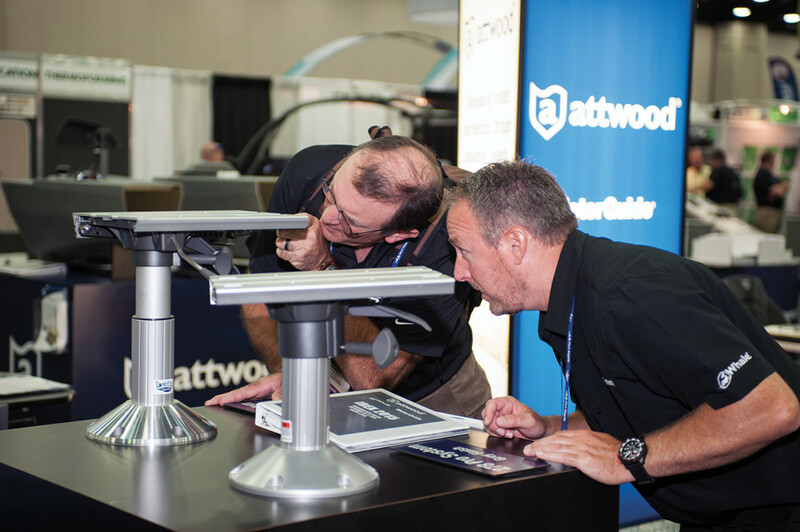 Whether the industry showcase for new products and innovation returns to Louisville, Ky., is up in the air. The uncertainty follows a decline of nearly a third in attendance at this year’s Louisville show from the 2014 turnout in Tampa and a dip in the number of exhibitors. A total of 4,700 people attended this year’s IBEX — down from 6,900 last year. There were 545 exhibitors (110 of them new to the show), compared with 558 in 2014. But what this year’s show lacked in quantity, it more than made up for in quality, say organizers. “All the right people were here,” says show director Anne Dunbar, and the volume of new and innovative product was at the highest level in recent memory. Despite those successes, the Kentucky venue remains a concern. “There’s a possibility we’ll go back to Louisville in 2017, and we’re discussing our options and expect to have a decision on the 2017 show location in the first quarter of 2016,” says Thom Dammrich, president of the National Marine Manufacturers Association, which owns and produces IBEX. As things stand, IBEX is scheduled to return to Louisville in 2017 and 2019, but organizers have the right of first refusal to also hold those shows in Tampa, which already is the host city for the 2018 show. IBEX executives are considering a list of alternative locations, which they decline to disclose. Would a more central location, such as Chicago, please some industry players from the western part of the country? How may potential venues in Miami and Fort Lauderdale change over the next few years? If the show permanently moves to Tampa, would the conferees eventually tire of that location? These are questions that organizers are mulling as they simultaneously solicit exhibitor feedback. IBEX was moved from Miami Beach to Louisville, beginning in 2010 near the depths of the Great Recession, as a more central and less costly location. One hurdle to the venue is getting there, particularly for companies in the western United States and Europe, because flights into Louisville are far less frequent than to Florida cities. What is clear is that IBEX was held in Louisville in 2010, 2011, 2012 and 2013. Last year the show was held in Tampa before returning to the Kentucky Exposition Center in Louisville in September this year. During that time a clear pattern emerged. Attendance this year was down 31.8 percent from the 2014 show in Tampa and was in line with attendance from the 2013 show in Louisville. “We expected attendance to be down from Tampa to about what it was the last time in Louisville, and that expectation was met,” says Dammrich. IBEX organizers are quick to note that Louisville has its own appeal, and some even favor the location. Holden says that regardless of the location, IBEX organizers already have plans to beef up the show’s seminar series in 2016 and have put together an advisory committee to develop the educational component. Attendees can also expect the dock space and on-water component offered at Tampa to be better utilized. Based on attendee input, organizers may also develop new events after show hours to offer more networking opportunities. What wasn’t lacking at Louisville was the innovation that has made IBEX the industry’s showplace for new product. Dunbar says the improving economy has motivated manufacturers to increase investments in research and development. One result of the R&D resurgence was a record 90 entries in the IBEX Innovation Awards competition (see Page 28). Much of the new product came in propulsion and electronics. An array of new propulsion products was showcased, including engines in all three major segments (outboard, inboard diesel and gasoline sterndrive). Volvo Penta launched the new gasoline sterndrive engines it had unveiled to the media a month earlier — two V-8 5.3-liter engines in 300- and 350-hp models and a V-6 4.3-liter engine with 280 hp. All use General Motors Generation V engines with increased technology. The “midrange” outboard Honda had promised to unveil at the show turned out to be a 100-hp 4-stroke. The BF100 bridges the gap between Honda’s BF90 and BF115 models. ABYC senior certification instructor Kevin Ritz addresses participants during one of the popular IBEX educational programs. Honda also says it has signed an agreement with Northport Commercial Finance that “will help dealers be better able to wholesale-floor boat-motor packages with Honda Motor Co.,” DiPietro says. Cummins, meanwhile, has come out with a streamlined version of its QSB6.7 diesel — the QSB6.7 SL (Slim Line). “We’re offering alternatives on some of the marinization components that allow us to align value and price, reduce weight and engine footprint,” says Cummins marketing manager Andy Kelly. The SL gives OEM boatbuilders the opportunity to lower the price by replacing advanced and costlier parts with more economical ones and switching to simpler component installation, says Rick Newman, Cummins global business development leader. For instance, the SL, because it will be offered in lower-horsepower sizes, will have a resized cooling system with a smaller heat exchanger and aftercooler; a disposable air filter instead of a high-end cleanable filter; a steel oil pan instead of cast aluminum; side-mounted filter locations instead of a more complicated front-mount location; and a simpler (but less versatile) engine-mounting method. The QSB6.7 can be engineered for horsepower outputs from 250 to 550. The SL models will be available in 355-, 380- and 425-hp versions. It is about 71 pounds lighter than the standard 6.7 and only 40 pounds heavier than Cummins’ 5.9-liter engine. The QSB6.7 SL will be available in the late winter or early spring of next year, Kelly says. Mercury Marine captured an IBEX Innovation Award for propulsion/propellers for its Flo-Torq SSR-HD propeller hub system. (MotorGuide, a Mercury company, also grabbed the top honor in the outboard category with its MotorGuide X5 trolling motor). What’s the big deal about Flo-Torq? It reduces noise and vibration (“clunking”) during engine shifting of Mercury multiple-engine installations of its big outboards (such as the 350 Verado and 400R Verado). It can be used with or without Mercury Joystick Piloting helm control. “A lot of times the engines are called upon to shift multiple times [when operated with the joystick] as they’re functioning on these large boats, so we wanted to smooth out the shifting, and that’s what this does,” says David Foulkes, Mercury’s vice president of product development, engineering and racing. The new hub system was introduced in July. SSR stands for Soft Shift Rubber. It is installed with high-horsepower engines with a heavy-duty 1.25-inch propeller shaft. Electronics and electrical equipment makers continue to generate new and innovative products. Many of the fast-paced tech advancements revolve around “connectivity” — technology that not only integrates electronics, but also links them to the cloud and mobile devices and computers. The idea of sharing data to make boating better and more enjoyable has started to come to fruition. IBEX’s Connected Boat Display illustrated that technology; at least a dozen electronics, engine and instrument manufacturers participated with their products — an impressive demonstration of multiple brand devices sharing data across multiple networks. Simrad, Mastervolt, Honda, Faria and Antisense Marine Accessories were some of the brands involved. Joe Burke of Chetco Digital Instruments, for the second consecutive year, designed the Connected Boat network. The big news, according to Burke, is the ability to interface between a boat’s NMEA 2000 network and most cellular data services. “It takes data from the vessel to the cloud and then to devices off the boat, including mobile devices,” says Burke, whose business now offers Smart GPRS, which contains a cellular data modem and a removable SIM card to allow use on most mobile networks, including AT&T’s new M2X data service, which offers a 10X reduction in monthly access charges. M2X (machine to cloud) is designed for interfacing sensors directly to cloud services, such as Chetco’s HelmSmart.net data analytics website, with a monthly access fee as low as $2 a device. A stainless steel razor inside the tie’s receiving end plays the key role. After the tie has been pulled to its desired length or tightness, you simply twist the tail and the razor leaves a clean, flush cut without sharp edges. With no tool required, the risk of damaging whatever you’re bundling is eliminated, Elsner says. The ties come in 8-, 11- and 14-inch sizes. Keynote speaker and baseball Hall of Famer Johnny Bench. Power Products held a press luncheon to highlight new products across its seven brands — ParkPower, Ancor, Mastervolt, BEP, Marinco, ProMariner and Blue Sea Systems. David Johnson, the company’s senior vice president of marine and mobile of the Americas, listed some new electrical devices from Blue Sea, and his colleague, Danny Ascencio Hall, later demonstrated them. The Mini Add-A-Battery Plus is sold with a BatteryLink charger and is capable of juicing two batteries at or away from the dock. The Mini Add-A-Battery simplifies switching between the two batteries. Bottom line: The product virtually “eliminates the risk of getting stranded with a dead battery,” says Johnson. Two dual USB chargers — one that fits a 12-volt charging receptacle — deliver 4.8 amps of charging power and feature “intelligent device recognition” (optimizes charging for Apple and non-Apple devices). It can be used with 12- or 24-volt systems. The Mini OLED (organic light-emitting diode) DC voltmeter monitors 12- and 24-volt systems with a bright waterproof daylight-readable screen. The product has been used in commercial applications (mainly for monitoring industrial electrical panels) for about a year. The recreational version retails for $1,199. Dometic is always eager to show off new product, and this year was no exception. Ned Trigg, senior vice president of global system sales, began a tour of the company’s display with the CRX-50 built-in refrigerator with a slide-out freezer section. It can quickly transform itself to a refrigerator only or a freezer only. The electronic control panel, which has LED lighting, fits flush in the side wall for easy reach, and its soft-touch buttons for power and temperature are easier to use than knobs. Versatility also stands out as a strong point for the company’s new reverse-osmosis water purification machinery — the XTC-ZTC Double Pass System. It purifies feed water from any source — salt water, brackish water, fresh water or dockside water. The first pass makes potable water and the second purifies it further — so clean it leaves no spots after it’s used to wash yachts, says Trigg. Designing cooling products for marine use is a challenge because it relies on the use of corrosive seawater. The Dometic Titan Low-Profile 60 is the first marine chiller to use titanium in the condenser instead of cupronickel, says Trigg. Titanium fends off the punishment of salt water and invasive marine life, he says. 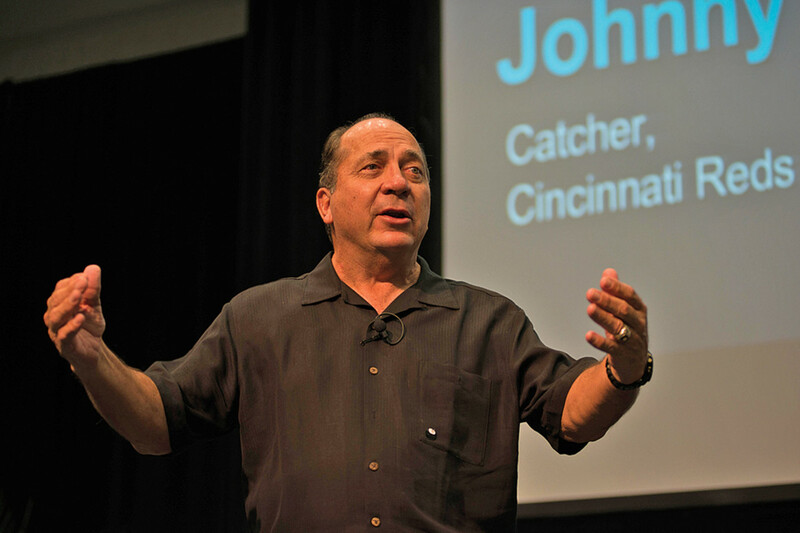 Major League Baseball Hall of Famer Johnny Bench hit it out of the park as keynote speaker. His breakfast address on the “Vowels of Success” outlined the path he encourages people to follow to achieve success. Bench warmed the audience with anecdotes about growing up in Oklahoma and glimpses of his professional career, which began when he was drafted by the Cincinnati Reds at age 17. It culminated in his 1989 induction into the MLB Hall of Fame. Bench’s “vowels” include Attitude; Effort for Excellence; No I in Team; and Using Knowledge. “Aspire to inspire before you expire,” he says. IBEX opened with a prediction by NMMA president Thom Dammrich that the boating business will enjoy “good times” for at least 2-1/2 more years. Managing Editor Rich Armstrong contributed to this report.